I'm constantly doodling and coming up with new quilt designs. Lately, a lot of them have been a little more complex. Throw in my desire to do some more custom machine quilting and I've found myself with a lot of in-progress quilts that I'm spending a lot of time finishing. Don't get me wrong, I love those projects, but sometimes there's something satisfying about finishing something in a short period of time. 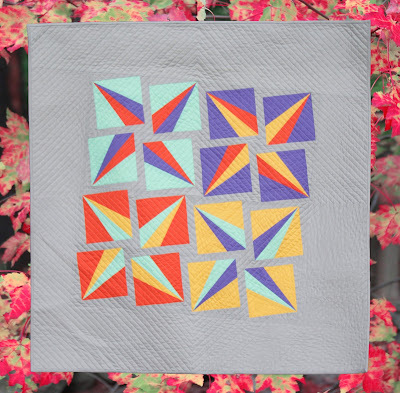 Introducing Dancing At Dusk, my latest quilt and newest pattern. This, like most of my quilts is a paper pieced quilt that is super easy to make. I made each block in probably an hour, making it the perfect after-work project. I could make one block a night and then I added the outer fabric to make the stars stand out. Bam... a finished quilt top in a week. But like most projects of mine, I sit on them for a little while as I contemplate quilting options. I eventually quilted this by drawing a square in the center and continuously echoing around the square out to the edge using some 50wt Aurifil thread. As I was designing this, I fell in love with the colors that I mocked up in my design program and just HAD to use the same colors. Fortunately for me, I have an extensive stash of Michael Miller Cotton Couture solids and had enough (1/2 yard) of each color and a couple yards of the fog on hand to get started immediately on this. I absolutely love the movement that the blocks create. It's amazing what happens when you simply twist a block slightly. It just goes to show you that if you play with your designs, great things can happen. The batting is a piece of Warm and Natural that was left over from another project. It finishes at 36" x 36" square. The pattern is now available in my Craftsy shop. If you make one, I'd love to see a picture of it. Why hello there October, you sure snuck up on me. September was a crazy insane month at work as my company was part of the largest technology merger in history. 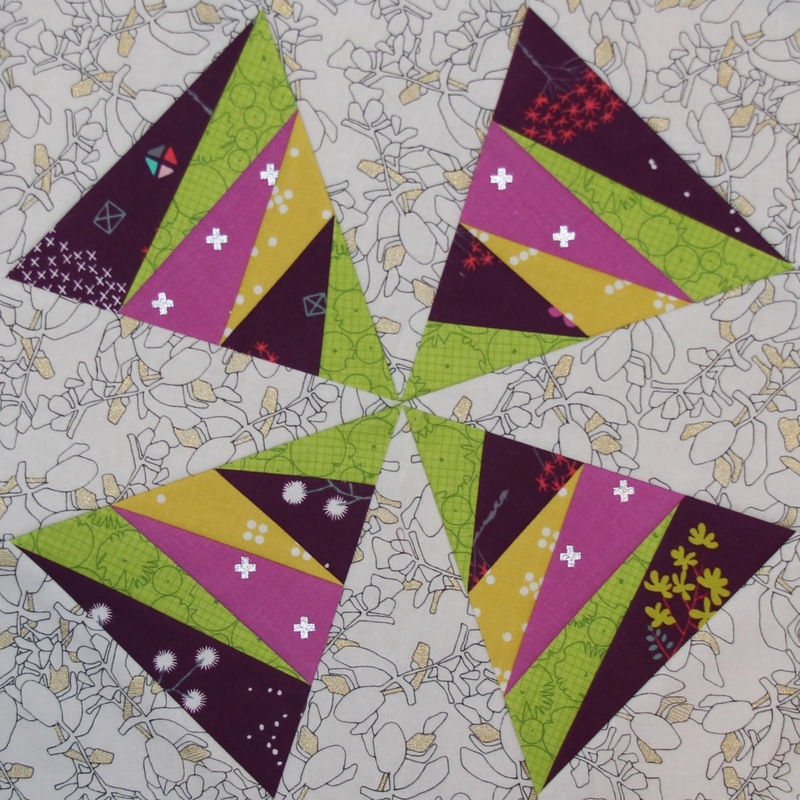 Fortunately, we're onto the next stage, so I have a little more time to quilt. 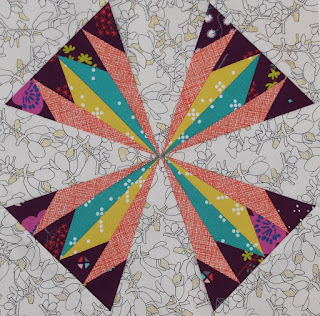 That means I can oogle over this month's blocks in the Kaleidoscope BOM. I'm absolutely in love with this block. I don't know what it is about it, but the colors in this block sing to me, maybe more than any other block to this point. They just go together so well and create such a dynamic block. I might have to make a whole quilt using this color way. 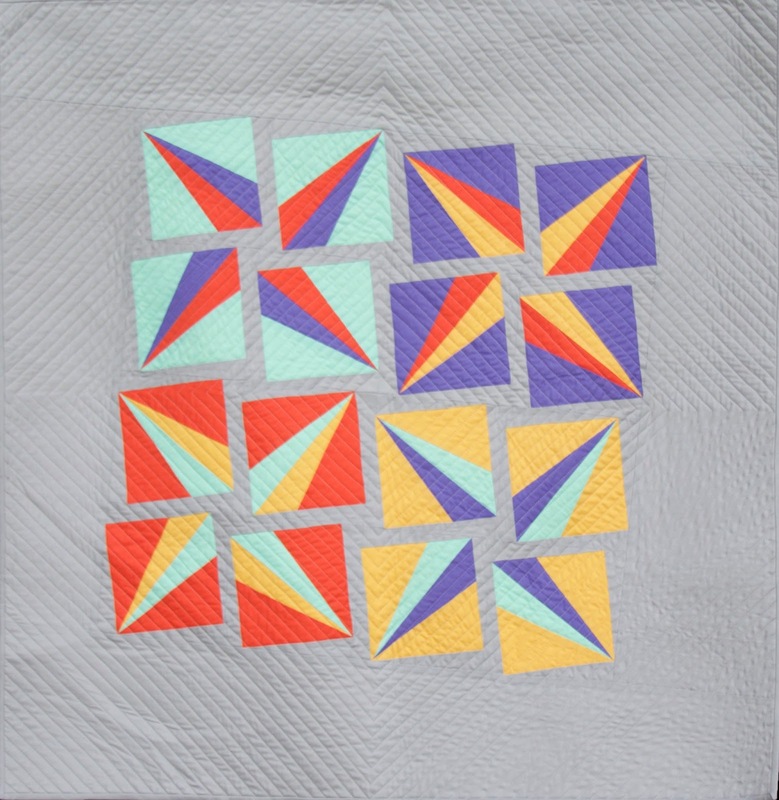 Could you imagine an entire quilt using this block? 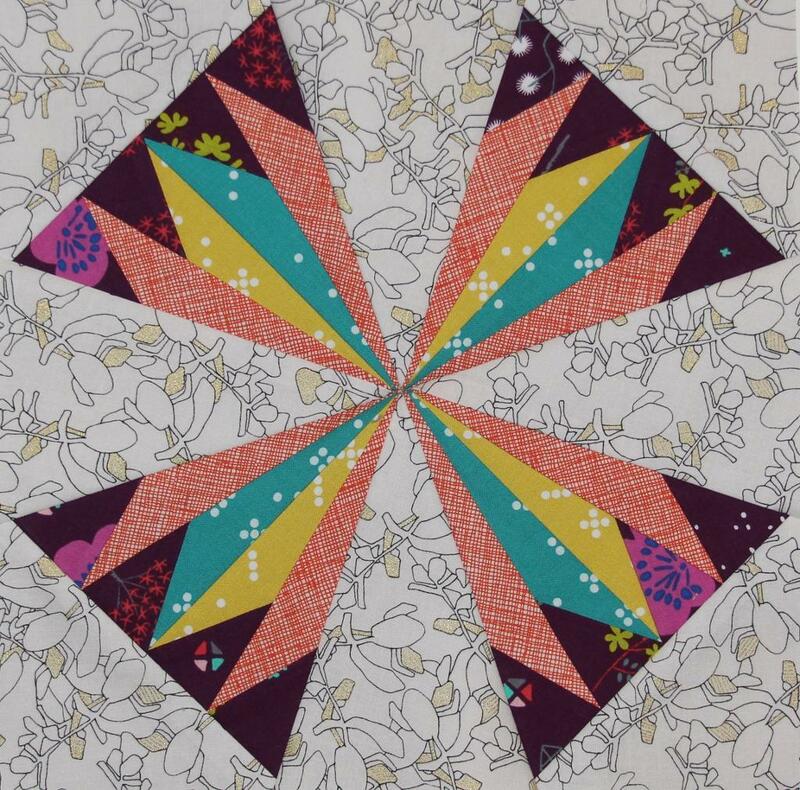 It would just scream for some continuous circle quilting. The movement is so fun. It's the color placement, with the green on one side and purple on another that really gives it movement.